Can acupuncture and Chinese herbal medicine help with the pain and healing of a broken bone? The answer is yes. Acupuncture and Chinese herbal medicine both create an analgesic effect in the body to reduce pain, stimulate the flow of qi and blood to promote healing, and Chinese herbal medicine can also increase bone cell production, reducing healing time. The acupuncture meridians, of which there are 12 major channels, run vertically up and down the body. These meridians are channels for the movement of qi and blood, as well as a communication system for different areas of our body. When a traumatic injury such as a broken bone, or surgery occurs, the channels in the body can become disconnected, stuck or literally cut at the area of trauma. This blocks the flow of the channel and can reduce healing time, leading to further disharmony. It is very important to treat a traumatic injury in its acute phase to correct the flow within the channel and restore the natural flow of qi. You can think of channels as pathways for qi and blood. Blood brings oxygen and nutrients to the tissues of the body. If the pathways of blood flow are not open, healing will take longer. 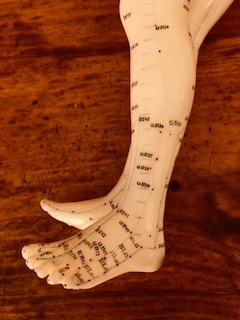 The use of acupuncture points along the affected channel(s), as well as around the site of injury stimulates the flow of qi and blood both within the channel and to the surrounding tissues to facilitate healing, reduce swelling, and alleviate pain. There are specific points that are considered “master’s” of a type of tissue. For example there are master points for sinews, bones, and marrow, all of which can be incorporated into an acupuncture treatment to increase the rate of healing. It is known that acupuncture produces an analgesic, or pain reducing effect in the body. Using points along the affected channels as well as locally at the site of energy can help reduce pain and bring relief. Recently I treated a 61 year old male who had suffered a shattered talus bone (ankle bone). I included in my acupuncture treatment the Jing well, he sea and shu stream points of the affected channels to open and stimulate flow along the meridians, as well as local points to reduce swelling and pain. The client could feel the effects of the treatment immediately and reported feeling a moving sensation, reduction in the burning sensation along the bladder channel, and an anelgesic effect. He was prescribed two formulas from Evergreen (a Chinese herbal medicine supplier) including Flex TMX and Osteo 8. Flex TMX is based on a formula originally used by kung fu masters and monks in the Shaolin temple to treat different types of internal and external injuries. This formula treats traumatic injuries through the use of herbs that have analgesic properties, anti-inflammatory actions to reduce inflammation and swelling, has a haemostatic effect to stop bleeding from trauma and injuries, and to improve circulation to facilitate healing. This formula also helps regenerate bones and soft tissues. Osteo 8 is a formula that stimulates bone cell generation and can be used in recovery from broken bones as well as prevention of osteoporosis. The functions of this formula are to stimulate osetoblast proliferation and differentiation, protects bone cells to prevent and treat osteoporosis, increases absorption and utilization of calcium, increases bone mass and density, and can stimulate blood vessel formation, invigorate blood circulation, facilitate would healing, enhance tissue regeneration, and facilitate healing of bone fractures. Osteo 8 is comprised of ingredients that replenish Kidney essence, Jing, as well as tonifying the yin and yang of the Kidneys, and Qi and Blood. The client reported an immediate analgesic effect with the use of Flex TMX, and a reduction in swelling. Bruising healed quickly with much less swelling, tenderness, and discoloration within 2 days of herbal treatment. After 2 weeks of taking the Osteo 8 the client reported feeling like the healing time was much reduced and that he was able to do more physical activities than his doctor’s had predicted, although he still tired with exertion, he had more energy than expected. The use of acupuncture and Chinese herbal medicine in the acute phase of a traumatic injury can have many beneficial effects including reduced healing time, reduced pain, reduced swelling, and more health and vitality. Please do not use Chinese herbal medicine without the guidance of a licensed Oriental Medicine Practitioner. While herbal medicine is generally considered safe, undesirable side effects can occur with improper usage. 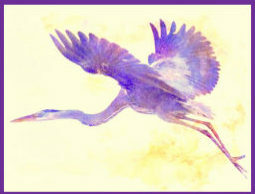 Please visit my website at www.blueheronacupuncturevt.com for more information about the services provided at Blue Heron Acupuncture, LLC, to read other blog posts, or to schedule an appointment. Please contact Christina at christina@blueheronacupuncturevt.com or via phone at 802-595-2248 with any questions you may have. Hi there! Such a nice article, thank you! I really appreciate that you mentioned the Osteo 8 acupuncture points to stimulate the bone cells to regenerate and help patients recover from osteoporosis. This would be a very good adjunct therapy for Grandma who’s suffering from brittle, bent bones due to her age. I’m sure she’d appreciate any form of treatment that could help her regain her strength and health, even if it’s simply to keep her bone tissues from degenerating as quickly as they would without acupuncture needling. What got me most interested here is that there are “master” acupuncture points for each type of tissue that could make healing faster when stimulated with needles. Mom would sure want her aching lower back treated with acupuncture because it’s been killing her, making her daily chores unbearable. She’d be glad to have her nerves and spines loosened up with increased blood flow, so she could go back to standing up long hours preparing the family’s favorite dishes. I’d schedule a visit with the neighborhood acupuncturist on Sunday.